The last three decades in Michigan’s trail movement have been about securing individual trails of all types: abandoned rail, utility corridors, road rights of way, and more. Today, Michigan can extend these trails east and west to reach from one Great Lake to another, weaving in many communities and tourism attractions along the way. Michigan Trails & Greenways Alliance has identified 5 Great Lake to Lake Trail routes across the state. In 2011, over 150 stakeholders were identified for the Great Lake to Lake Trails. Stakeholders included the Michigan Departments of Natural Resources, Transportation, Community Health, Travel Michigan, the Governor’s Council on Physical Fitness, the National Parks Service, Michigan Recreation and Park Association, many regional trail coalitions, regional planning and transportation organizations, local governments, elected officials and personnel, and individual trail advocates. Convening stakeholders, developing vision and goals, articulating a strategy and prioritizing projects were the first steps taken to ensure this would be a project that we could bring to fruition. Confirming the name and creating the identity for the trail were also outcomes of Phase 1 planning efforts. Route 1: advocating and planning for its development, marketing, and connecting it to other destinations in their areas. Michigan Trails & Greenways Alliance staff and trail ambassadors conducted field analysis, feasibility studies and dialogue with city and township officials along with law enforcement, transportation and health agencies to come up with viable routes in each of the gaps. Trails were inventoried for each existing trail segment in the approximately 315-mile route as to its surface, endpoints, and current condition. 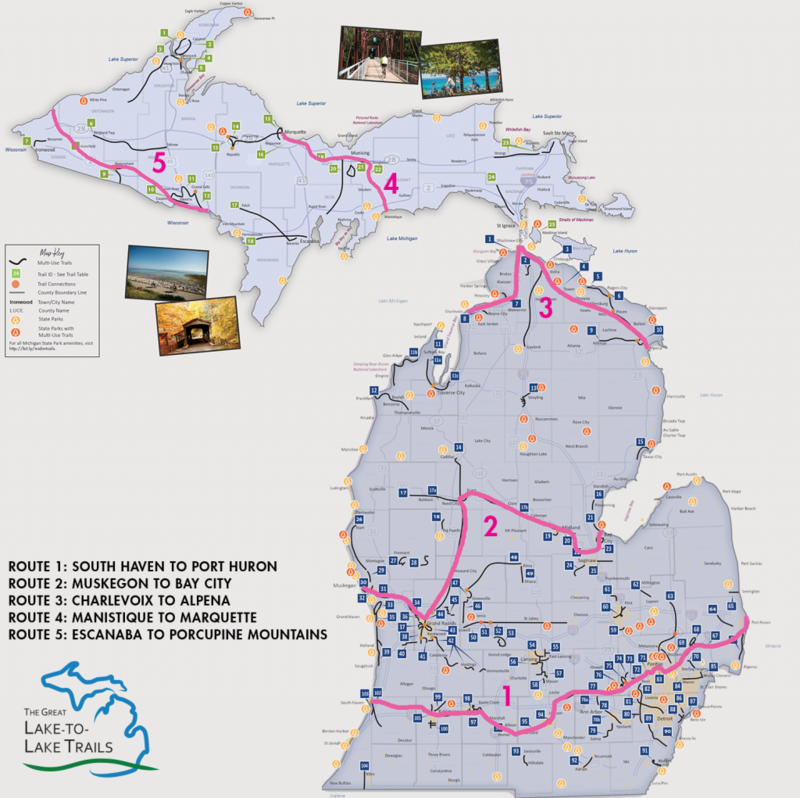 Our current work is to support the completion of Great Lake to Lake Trail Route #1 from South Haven to Port Huron. Plans are in place to open the trail by the fall of 2019. With a generous financial commitment from philanthropist Mike Levine, wayfinding, signage along the route (trailhead and trailside facilities, signage, kiosks, and maps) and gap connections are in the works for select portions of the trail that can be applied to the overall trail way finding. Additional funding is necessary to take the wayfinding work across the entire trail. Continued focus on wayfinding, and marketing, including historic interpretation and interpretive displays, Great Lake to Lake Trails website, and event planning for the inaugural ride for fall of 2019. General financial support is required to continue this important work for both Phase 3 and Phase 4 to ensure Route 1 is open to all by fall of 2019. Donations will assist with staff time, historic interpretation, travel, marketing & PR, brochure and web design and event planning dedicated to the project over the next two years.